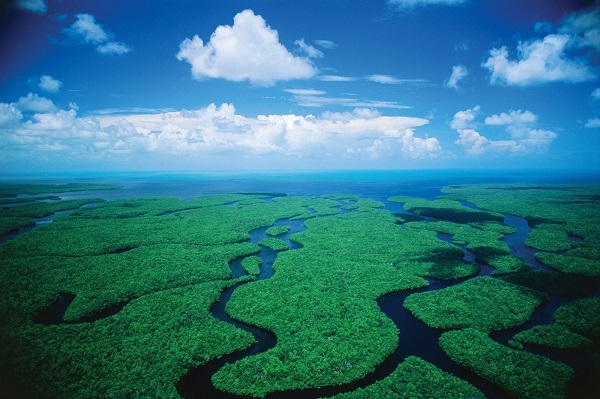 Welcome to the Everglades National Park Information Page. The closest major airport is Miami International about 45 miles northeast of the park. Visitors coming from the Miami area and points north may take the Florida Turnpike (Route 821) south to the Florida City exit. Turn right at the first traffic light onto Palm Drive and follow the signs to the park. Visitors driving north from the Florida Keys should turn left on Palm Drive (344th Street) in Florida City and follow the signs to the park. Take the Florida Turnpike to the exit for SW 8th Street (also known as US 41 and Tamiami Trail). Travel 25 miles west on US 41 to signs marked Shark Valley. From the Naples area, take US 41 (Tamiami Trail) east to signs marked Shark Valley. Take U.S. 41 west from the Miami area to the intersection of US 29, then take US 29 south three miles into Everglades City and follow the signs to the park visitor center. From the Naples area, take US 41 east and turn south on US 29. Take Krome Avenue (S.W. 177th Ave.) north from Homestead or south from US 41. Go west on SW 168th Street and follow the signs to the park. Miami and Fort Meyers are serviced by international airports, buses, and numerous car rental agencies. Miami has an Amtrak station. The park may be explored by personal vehicle, commercial tour bus, bicycle, motor boat, or canoe. There is NO public transportation in the park. On 30 May 1934, an Act was passed authorizing a park to be acquired through public donations. Everglade National Park was to be “…wilderness, (where) no development … or plan for the entertainment of visitors shall be undertaken which will interfere with the preservation intact of the unique flora and fauna of historic values the essential primitive natural conditions now prevailing in this area.” This mandate to preserve wilderness and its biota is one of the strongest in the legislative history of the National Park System. Thirteen years later, through a combination of federal, state and private lands, a vast wetland teeming with life was dedicated as a national park. Everglades was the first national park preserved primarily for its abundance and variety of life, rather than for scenic or historic values. Boundary changes since 1947 have substantially increased the size of the park from the original 460,000 acres (186,159 hectares). In 1950, the Secretary of the Interior increased the size of the park to 1,228,500 acres (497,167 hectares), including the former wildlife refuge. Two additional boundary changes increased the park to 1,400,533 acres (566,788 hectares) by 1958. In 1989, Congress passed legislation that expanded the eastern boundary of the national park by 109,000 acres (44,112 hectares), primarily for the purposes of ecosystem restoration and protection. Everglades National Park is open year round. Highest visitation is from December through April, and the lowest visitation is May through November. Walking and canoe trails, boat tours and tram tours are excellent for viewing wildlife, including alligators and a multitude of tropical and temperate birds. At the end of the nineteenth century the south Florida coast was still largely wilderness, one of the last coastal regions east of the Mississippi to be settled. Only three small communities, Chokoloskee, Cape Sable and Flamingo, existed along the coast of what is now Everglades National Park. The 1910 federal census record shows 49 people living in Flamingo and Cape Sable. Most listed their profession as farming. There were ten heads of households, with 18 children and seven servants. Five people were cane farmers and one worked in charcoal making. (Charcoal was sold in 100 pound sacks at Key West.) Jobs that other individuals held were boatmen, farmer, hauling cane, cane farming (13) and one was retired. Many, if not all, fished for cash and food. Most also hunted. At the turn of the century plume hunting was a major source of cash income. Many wonders may be seen from a car window, but the Everglades reveals its greatest treasures to those who take the time to get out into it and experience its beauty firsthand. Each of us has different abilities and needs. This page should help you find and take full advantage of the facilities and resources available to you in the park. Camping: There are three campgrounds in the park. All three have accessible campsites. Each has wheelchair accessible restrooms. There is one backcountry site that is accessible to people with mobility impairments. It is the Pearl Bay Chickee, which is about a four hour canoe trip from the main road. It features handrails, a canoe dock, and an accessible chemical toilet. Lodging: The Flamingo Lodge has two accessible rooms. A second floor restaurant is accessible by a steep ramp. Boat and Tram Tours: Many of the boat tours from Flamingo are accessible. Other tours on smaller, privately owned boats may not be. Ask when making reservations. The Shark Valley tram tour is accessible; call ahead to make arrangements. This tour includes a stop at an observation tower which is reached by a 10% ramp. Bicycling is permitted along the main park roads, on the Shark Valley tram road, on the Old Ingraham Highway, on Long Pine Key Nature Trail, and on the Snake Bight and Rowdy Bend trails at Flamingo. Bicycling at Shark Valley is a great way to experience the quiet beauty of the Everglades. As the saw grass prairie slowly unfolds before your eyes, stop and take a moment to enjoy the life that abounds. The park’s inland and coastal waters lead to the remote Everglade spots. Rent boats and slips at Flamingo. Buy navigational charts at Flamingo marina, Ernest F. Coe Visitor Center, and Everglades City. There are three campgrounds inside the park; Long Pine Key, Flamingo, and Chekika. All campgrounds are open year round. Camping from May through October will be by self-registration at all campgrounds. Fees are not charged from June to August. If you have a Golden Age Pass (U.S. citizen 62 or older) or Golden Access Pass (permanently disabled), camping is half price. This does not apply toward group sites. Canoeing is an excellent way to explore the Everglades, because more than one third of the park is made up of marine areas and shallow estuaries. Check at the Flamingo or Gulf Coast Visitor Centers for maps and directions. Canoes may be rented at Flamingo and Gulf Coast. All waters from, and including, Nine Mile Pond northward along the Main Park Road are considered fresh water. Interior rivers in the northern part of the park, such as the Turner River, are fresh water. Contact the Visitor Center and get up to date information on your catch limit. You are responsible to know your catch limit. There is a restaurant and store at Flamingo. The restaurant may be closed during the summer; however, food is always available at the marina store. Local restaurants and grocery stores are available in Homestead, Florida City, Everglades City, and Miami. There are no banks or automatic teller machines in the park. Gasoline may obtained at the Flamingo Marina, and in communities adjacent to the park. Everglades National Park has many miles of hiking and biking trails. Choose the area of the park you are interested in exploring. Horseback riding in the park requires a special use permit. Contact the chief ranger’s office at 305-242- 7700 for more information. Permits are required for backcountry camping. Film permits and special use permits are handled on an individual basis; call: 305-242-7700. For research and collection permits, call: 305-242-7800. This fee, for the issuance of the required backcountry permit, will be a single charge per group. Pets must be physically restrained and are not allowed on trails or in the amphitheaters. Walking and canoe trails, boat tours and tram tours are excellent for viewing wildlife, including alligators and a multitude of tropical and temperate birds. Camping, whether in the backcountry or at established campgrounds, offers the opportunity to enjoy what the park offers firsthand. Ranger Led activities, offered throughout the park, may help you to enjoy your visit even more. Visitor centers are located at the main entrance (west of Homestead), Royal Palm, Flamingo, Shark Valley, and Gulf Coast (south of Everglades City). The Everglades is mild and pleasant from December through April, though rare cold fronts may create near freezing conditions. Summers are hot and humid, with temperatures around 90 F / 32C and humidity over 90%. Afternoon thunderstorms are common and mosquitoes are abundant.